Oklahoma Connection | Tuttle was born in Tuttle, Oklahoma. The town of Tuttle, Oklahoma, was named after Holmes Tuttle’s father James Harley Tuttle in 1902. Native Oklahoma Holmes Tuttle was born and raised in Tuttle and graduated from Oklahoma City’s Central High School. He began his career with the Ford Motor Company Plant in Oklahoma City in the early 1920s. In 1926 he moved to California and continued in the Ford dealership. 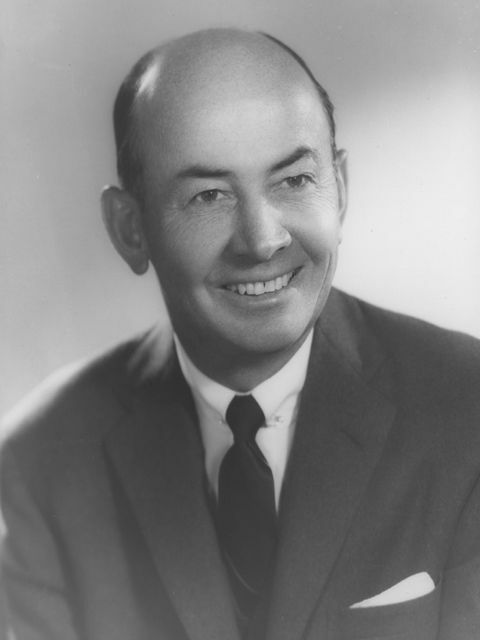 He took his first job as sales manager for the Ford dealership at Sunset Boulevard and Broadway in Los Angeles and later opened Holmes Tuttle Ford in 1946 at Beverly Boulevard and La Brea Avenue, a Lincoln-Mercury dealership in 1950, and Beverly Hills Lincoln-Mercury in 1955. In 1968 he established, in Beverly Hills, the first exclusive Lincoln agency in the U.S. He was a director of Dart Industries, TWA, and the Good Samaritan Hospital. He served on the state finance committee for Ronald Reagan’s campaign for governor in 1966 and 1970. See pictures of Holmes Tuttle and other media HERE.